Warm and welcoming community pub. Popular with young and old alike. The decor is golf and rugby themed along with historic photographs of Corstorphine. Lunchtime food includes wonderful pies. Dogs welcome. Unisex hair salon situated in Corstorphine. The Torfin in Corstorphine offers something for all tastes from delicious breakfasts, lunches and lights bites to a full evening menu. Try the finest cuts of Scottish meats & the freshest caught fish all cooked to perfection from our chefs. 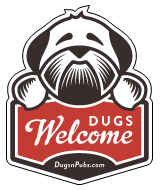 The newest restaurant in Edinburgh and we are dog friendly too! Well behaved dogs welcome in the bar area until 8pm. Dogs to be kept on leads at all times. Water, biscuits and towels provided. There are a total of 9 dog friendly listings in the Corstorphine category. Please log in, or sign up as a member to view all listings.